Our Personal Gardeners Ô are experienced and educated in all aspects of gardening. They'll treat your garden as if it was their own. You can truly think of them as your 'Personal Gardeners.' Ô So relax and call One Garden at a Time at 724-519-2126. We have gardeners in the eastern suburbs of Pittsburgh, Pennsylvania including Murrysville, Shadyside, Oakmont and Fox Chapel. Please note: We are gardeners, not landscapers. What's the difference? We don't cut grass or apply pesticides. We shudder when we see landscape fabric (or worse - black plastic!) One visit from our Personal Gardeners Ô, and you'll know the difference. Click on a topic to learn more about each aspect of our garden maintenance services. One day my husband, John, and I were driving down the street when suddenly I screamed. "What's wrong?" John asked in alarm. "Did you see how badly pruned that tree was?" I asked. John rolled his eyes in resignation. "Only you would scream about a badly pruned tree." Click on 'pruning' to learn more about my thoughts on the subject. We hand-weed and never use chemical applications. We also divide perennials in the spring or fall, add fertilizer according to soil test recommendations, and cut back fading flower heads to keep your garden looking its best. Whether you're planning a new garden or renovating an old one, we can advise you on the best way to proceed. We specialize in English Garden Design. The biggest mistake people make is not planting enough bulbs. 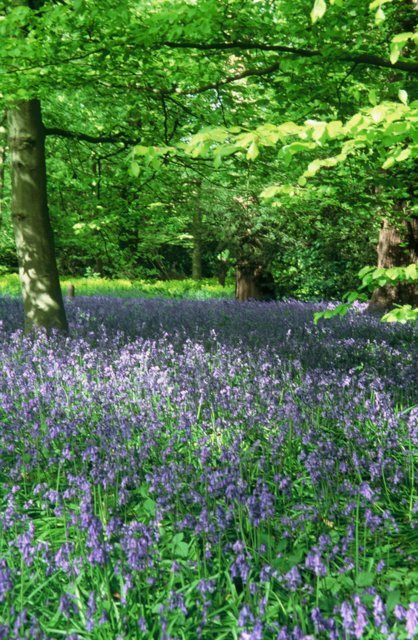 (photo, right, shows the gorgeous effect achieved by planting hundreds of English bluebells at the Royal Botanic Gardens at Kew, London) We'll advise you on the type and quantity of bulbs to order. Did you know the reason deer don't eat daffodils is that they are poisonous? So if you have a deer problem, daffodils are the perfect bulb. Allium, also, is usually deer resistant. Booklets Create your own English Garden with our tips booklet. FEES: $40 per hour for pruning and other garden maintenance. $65 per hour for design consultations, private pruning lessons, or personal plant shopping. Winter storms can really wreak havoc on your garden - especially trees and shrubs. Follow these winter garden tips so your garden will look beautiful in the spring. * Survey your trees and shrubs. Are branches snapped off, leaving a jagged edge? Are they partly broken, but still hanging on? Or is there no actual damage but they are bent over because the ends are covered in heavy snow? * Take action. If the branches are completely snapped off, leaving a jagged edge OR if they are partly broken, but still hanging on: Make a clean cut back to a branching point. Use the broken branches for kindling, or pile them up in an unobtrusive area of your property to provide shelter for small animals. If there's no actual damage but the ends are bending over due to heavy snow: Take a broom and sweep UPWARDS from the bottom of the branch, knocking snow off as you go. Most branches should spring back up into their original position. Never sweep downwards, as this will put extra pressure on the branch and may cause it to snap. * Once the snow's gone, look around for plants that might be heaved out of the ground. Gently step on them with your foot and push them back into place. Garden Tip# 2. How can I control weeds? * When you only have a short time in the garden, focus on just those weeds that are going to seed. Why? Removing these weeds will keep them from spreading, so you'll have fewer weeds in the future. * When you're overwhelmed by weeds that are taking over, pull just the tallest weeds. Why? Removing the tallest weeds will make a fast improvement in the overall look of your garden. * When creating a new bed, save your money and don't lay weed fabric or black plastic. Instead, use newspaper or cardboard under mulch to keep new weeds from forming. Why? Newspaper or cardboard will keep weeds from coming up under the mulch for up to a year. They'll naturally decompose. Weed fabric and plastic will never decompose, and in the long run, they don't really work. Weed seeds germinate on top of them, and so you still have weeds. * When cutting grass, make sure your lawn mower's chute sprays AWAY from your garden beds. Why? Weed and grass seeds will not spray into the beds and germinate, creating more weeds. GardenTip #3. When it all gets too much for you - call us! We hand-weed your garden so you don't need to use chemicals. We'll dig your weeds out by the roots -- and you can be sure we know the difference between weeds and your prized perennials. Our expert gardeners will prune your overgrown shrubs. We specialize in hand-pruning unusual shrubs like weeping Japanese maples. We can provide a garden evaluation and give you a list of what to plant in each area. . . or take you to the nursery and show you which plants to buy and which to avoid. Selling your house? We can give you tips on improving curb appeal.